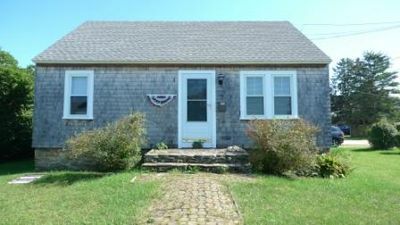 This is a FURNISHED rental for the off-season (Sept-May). May be flexible on timing and lease terms depending on the situation. 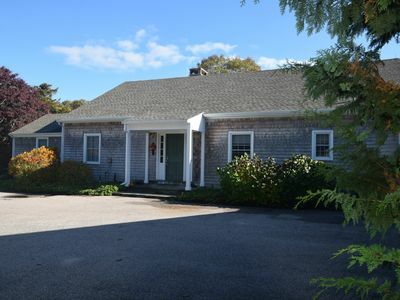 Charming coastal home in a quiet, private Association neighborhood near the RI shoreline. 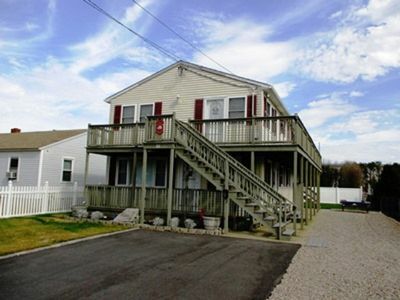 The neighborhood is situated on a nature preserve within walking distance to Avondale and Misquamicut Beach. Biking distance to Watch Hill Beach (3 miles), Winnapaug Golf Course (2.4 miles), Misquamicut Beach (2 miles) and Weekapaug Beach (5 miles). Nature abounds here as sightings of wild turkey, deer, rabbits and egret are all commonplace. This is a very quiet neighborhood. Well manicured and pristine. 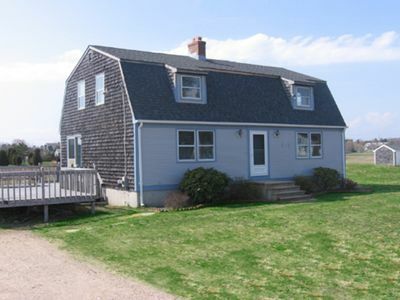 The house is a 3 bedroom, 3 bathroom (2 full/1 half bath), 2-story home updated with coastal charm. There is a FIRST FLOOR BEDROOM with a FULL size bed and its bathroom has a walk in shower. The second floor has a master bedroom with a king size bed and adjacent bathroom, a guest bedroom (queen size bed), and adjacent bathroom. 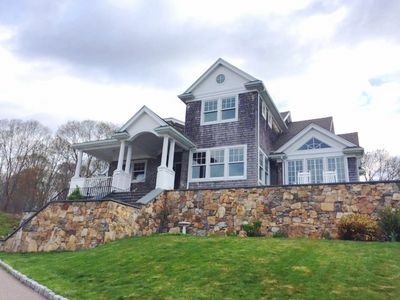 The master bedroom and upstairs guest bedroom have distant water views of Sandy Point and Stonington, CT. 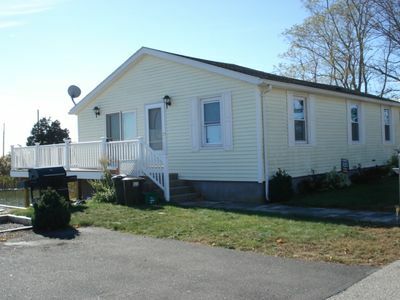 The laundry room is also on the top floor and has ample cabinets and countertops and a fold out ironing board. The living room boasts full-length french doors on all sides, allowing lots of light to pour in. 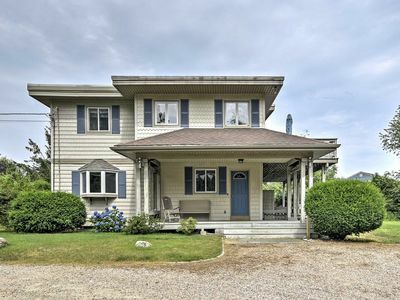 The doors facing the front of the house open to the front porch facing the yard. 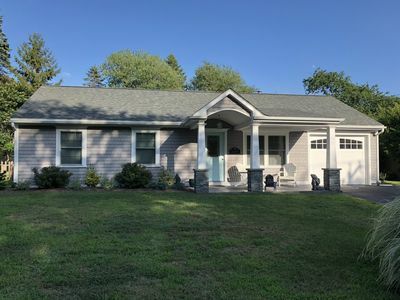 Enjoy a cocktail and views of a vast field from your Adirondack chairs on the wrap around front porch. The back doors to the living room open to the spacious deck. The focal point of the living room is the marble gas fireplace, adding to the warmth and ambience of the room. 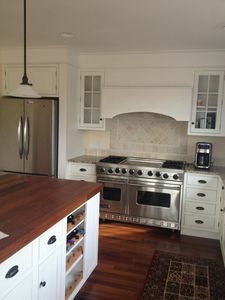 Flowing from the living area is a custom built kitchen featuring Kraftmaid cabinets in a french country style, updated with new stainless steel appliances. The counters are all topped with high-end imported granite. 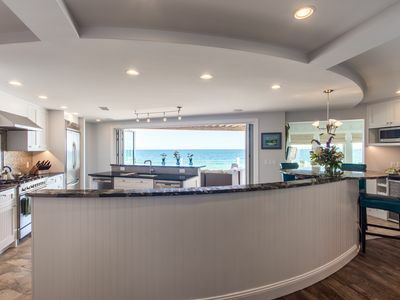 The center island has a Thermador 3-burner gas cooktop. There's lots of counter space including a buffet or bar section. A large strip of counter space passes through to the dining area that can also easily be used as another buffet. The kitchen appliances have been updated (2017/2018) with the latest smart home enabled LG appliances: A double wall oven with microwave and convection oven, French-door refrigerator with "Instaview glass," new dishwasher. Numerous built ins allow for plenty of kitchen storage. The transom windows allow extra rays of sun to beam across the kitchen from the cabinets. 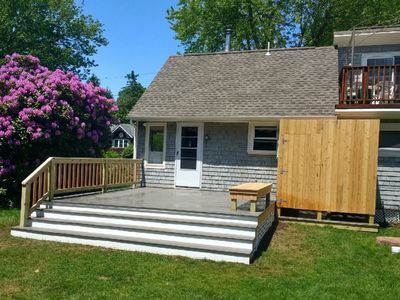 A door leads out to the back deck from the kitchen for easy access to the outdoor grill. The back deck overlooks the treetops and neighboring fields for serene outdoor dining as weather permits. Outdoor dining table seats 5. Outdoor seating seats 4. The foliage is spectacular. Upstairs there are two generously sized bedrooms, both with en-suites. 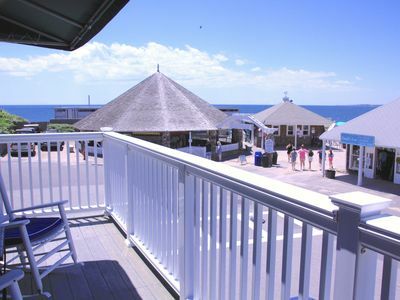 Both top floor bedrooms have breathtaking distant views of the water. 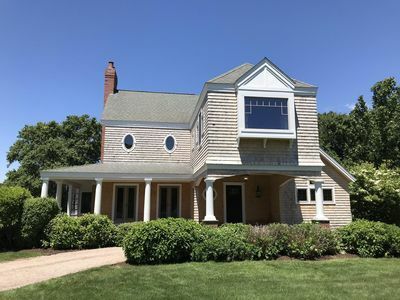 The upstairs master bedroom has a KING size bed, large vaulted ceilings with custom windows, a sitting/reading area with a chaise overlooking a vast field and gorgeous views of Sandy Point and Stonington, CT in the distance. The master bathroom is a Tuscan style with earth toned tile throughout, including the walk in shower. Enjoy a Jacuzzi from the hot tub overlooking the back woods. The upstairs guest bedroom has a QUEEN bed, facing a bay window overlooking the front yard. The bay window is the perfect area for reading or just relaxing- it has toile padded seating to match the window valences. The guest bedroom also has custom built-in wood shutters for that "at the beach" feel and added privacy. 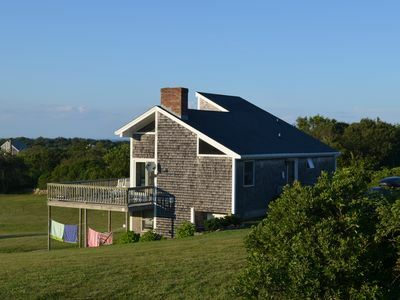 Looking out the side window to this room you will also see a gorgeous view of Stonington and Sandy Point in the distance. There is a 2 car garage. Oil heat/central air conditioning. Smart Home updates include ring doorbell and back flood light security. Tennis courts are a short walk away. Oil heat, central air conditioning. Even though we are making the house available for rent, we seek occupants who recognize that this is not necessarily a “rental” property. 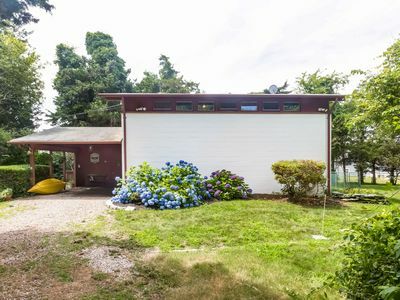 This is first and foremost our home, which we seek to maintain in the best condition possible, and returned to us in about the same condition as we left it. We seek occupants who will appreciate and respect the home, and recognize that while it is being rented, reasonably, we expect it to be left in working order and intact. 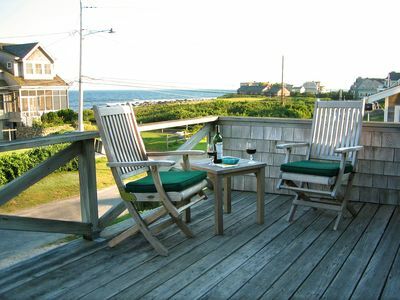 Top ranked hotels such as the Ocean House Relais & Chateau and Weekapaug Inn are just a few miles away. 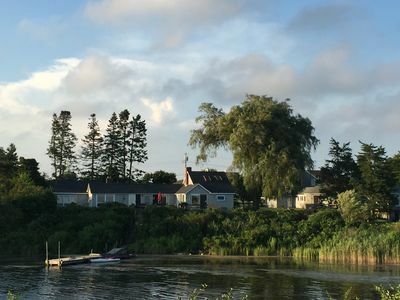 Other area attractions/things to do include: Winnapaug Golf Course, Pond View Racquet Club, paddleboarding, pottery painting, yoga, boating, fishing, tennis, all the shoreline has to offer. Yoga: High Street Yoga, Barre Coast, Mystic Yoga Shala (CT). 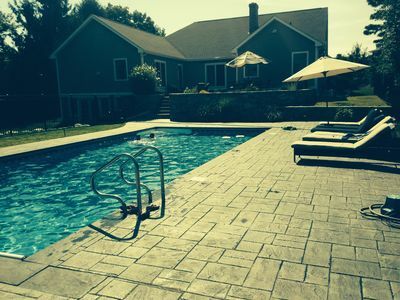 CT Wineries closeby: Stonington Vineyards, Saltwater Farm Vineyards. 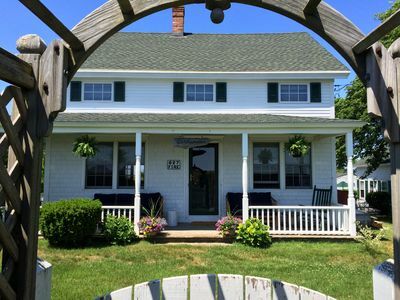 Hotels: Travel + Leisure top ranked Ocean House Relais & Chateau, Weekapaug Inn, Spicer Mansion in Mystic, CT, and The Inn at Stonington, Stonington, CT.
CT Restaurants: Dog Watch Café, Noah's, Red 26, Oyster Bar, Bravo Bravo, Grass & Bone, S&P Oyster House. Luxury home. Elevator. Sleeps 14. Central A/C. 2 Car Beach Passes. 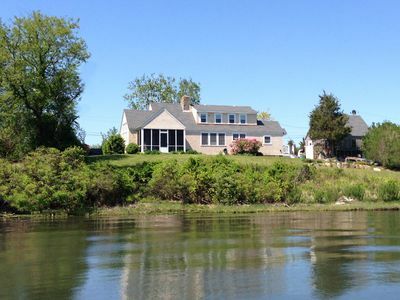 East Beach home with water views, private beach parking & 1 Prime week left!! 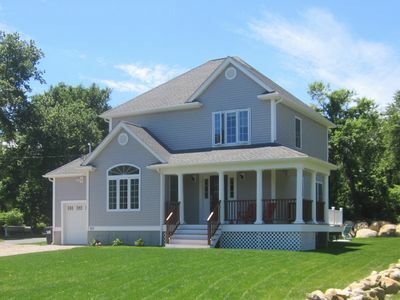 Views of Quonnie Pond with Weekapaug Beach Rights!